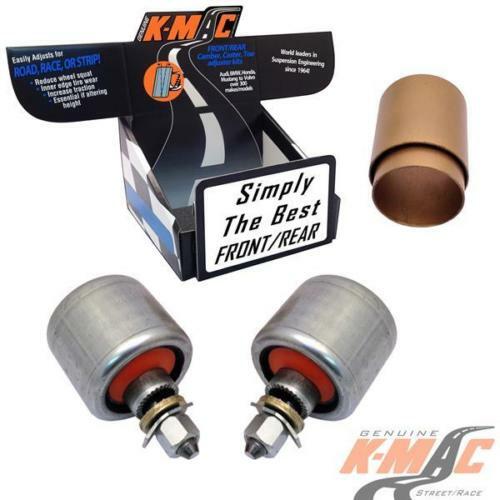 K-MAC “A WHOLE NEW GENERATION” – BUSHES ARE DESIGNED WITH TWICE THE LOAD BEARING AREA AND ARE MONO BALL / ‘2 AXIS’ WITHOUT THE OEM OIL AND AIR VOIDED RUBBER BUSHINGS is improved traction under braking and steering response (See CHECK LIST below ). Precisely adjustable Caster features patented single wrench adjustment – accurately (under load). Correctly resolves steering pull and allows increased positive Caster for improved high speed directional control, quicker turn in and with reduced dive/lift under brake and acceleration. 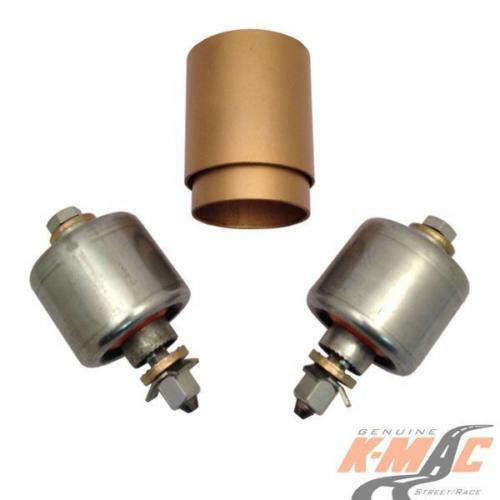 K-MAC kits also include bush extraction and insertion tubes. 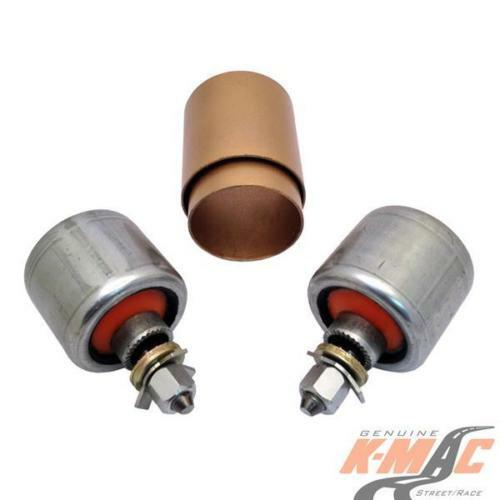 K-MAC BUSHINGS – Revolutionizing how adjustment is made – No more the time consuming and inaccurately need to reposition bushing each time a setting change is required and designed for absolute maximum adjustment range. Strongest, longest lasting. Featuring twice the load bearing area of OEM bushes. Hardened teethed nickel chromed steel centers with hardened teethed external steel washers. Double length nuts. Fail safe lock system. RESULT : FINALLY – PRECISELY ADJUSTABLE CASTER TO CORRECTLY RESOLVE STEERING PULL AND IMPROVE BRAKE AND STEERING RESPONSE. Along with improved high speed directional control better turn in, reduced dive / lift under brake and acceleration. Combined with Camber the adjustment capability to resolve costly premature edge tire wear and steering pull, The result of day to day commuting encountering high cambered roads, altered height through load carrying or lowering, fitting wide profile tires/wheels or curb knock damage. Along with ability to improve traction, understeer/ oversteer.